ESPN.com’s Buster Olney breaks down a big offseason for the Twins in an Insider post. While the team still faces a lofty task in unseating the Indians in the AL Central, it certainly seems to have achieved plenty of bang for the buck in adding multiple veteran pieces this winter. The Twins are on track to have over $125MM on the books to open the 2018 season, which will easily set a club record. Perhaps the most notable aspect of the organization’s opportunism this winter, though, is that it was able to add a variety of quality veterans without committing much at all in future resources. Not only that, but the club also feels quite confident in its prospect base, as Dan Hayes of The Athletic reports (subscription link). GM Thad Levine says the organization feels it has the pieces in place to allow the team to pursue yet more external acquisitions in the near future without compromising its long-term outlook. Meanwhile, chief baseball officer Derek Falvey told reporters today that owner Jim Pohlad did not veto anything proposed by his front office this offseason despite the payroll climbing to record heights (via Mike Berardino of the St. Paul Pioneer Press). While Falvey said the team will (obviously) evaluate trade needs more closely as the non-waiver deadline approaches this summer, he implied that he expects to have continued support from ownership. “I can tell you this: I know Jim Pohlad is committed to this team and committed to winning because he just proved it,” said Falvey at the press conference to introduce Lance Lynn. On a similar note (and also via Berardino), Falvey implied that the team’s pursuit of Yu Darvish wasn’t ultimately called off due to any kind of reluctance from Pohlad but rather because the bidding simply went beyond a point where the team felt comfortable from a baseball standpoint. “There were other opportunities we were pursuing that we tapped out ourselves,” Falvey said when asked about Darvish. Though he didn’t mention the righty by name, Falvey indicated that at times, players of interest to the Twins simply received offers that went beyond internal valuations in terms of years and/or dollars. La Velle E. Neal III of the Minneapolis Star Tribune takes a look at the considerable shortstop depth the Twins have throughout their minor league ranks due to the presence of Royce Lewis, Nick Gordon and Wander Javier. All three landed on Baseball America’s Top 100 prospects list, and Falvey spoke to Neal about the importance of that depth even with present-day shortstop Jorge Polanco entering just his second full big league season. As Falvey notes, some of the in-house prospects could move off the position, and it’s also of course possible that Polanco could move across the bag to second base should Brian Dozier leave via free agency. Neal notes that the Twins believe all three can play shortstop in the long run but are heartened by knowing that each has the athleticism to move around if needed. Gordon is likely ticketed for Triple-A to open the season, while Neal notes that in an ideal world, the 18-year-old Lewis (last year’s No. 1 overall pick) would open the year at Class-A Advanced with Javier in the Class-A Midwest League. Mariners center fielder Dee Gordon is among the notable players that will be joining Rep 1 Baseball, the agency announced today. Veteran agent Nate Heisler has joined the Rep 1 ranks as a vice president, bringing with him an array of clients. In addition to Gordon, the players going with Heisler to his new agency include major leaguers Liam Hendriks and Chase Whitley. Several prospects are coming along as well, includingJesus Luzardo and Jacob Pearson. Gordon is obviously the most notable name on this list. He’s also under contract through at least 2020, pursuant to the extension he inked with the Marlins back in 2016. Now with the Mariners following a December swap, Gordon has been tasked this winter with moving from his accustomed middle infield role into center field in Seattle. Hendriks is earning $1.9MM this year and will qualify for arbitration one final time at season’s end. Whitley, also a reliever, recently agreed to a $800K deal in his first trip through the arb process. Among the younger players, Luzardo has received top-100 leaguewide prospect billing. Rep 1 Baseball already represents such prominent major leaguers as Edwin Encarnacion and Miguel Montero. Its new clients are reflected in MLBTR’s Agency Database. An earlier version of this post indicated that Twins prospect Nick Gordon was also changing representation, as Rep 1 announced. A report from Jon Heyman of Fan Rag (via Twitter) now indicates that the younger Gordon will remain with the Beverly Hills Sports Council. 3:00pm: Jon Heyman of CBS Sports tweets that Gordon also receives scholarship money, which takes the deal’s value to roughly $4MM, though the scholarship’s value doesn’t count against the Twins’ bonus pool. 1:31pm: Mike Berardino of the St. Paul Pioneer Press reports (via Twitter) that Gordon signed for the slot value of $3.851MM. 1:21pm: The Twins announced, via press release, that they have agreed to terms with fifth overall pick Nick Gordon. The highly touted Gordon will head to Fort Myers, Fla. to participate in Twins mini-camp before joining the Rookie-level Elizabethton Twins in the Appalachian League. That season begins on June 19. 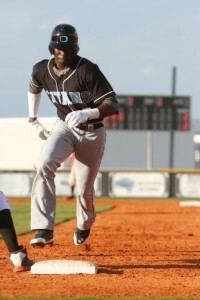 Gordon, a high school shortstop out of Florida, is the son of longtime Major League closer Tom Gordon and the brother of current Dodgers second baseman Dee Gordon. He ranked fourth among draft prospects per ESPN’s Keith Law, fifth according to MLB.com’s Jonathan Mayo and Jim Callis, and sixth according to Baseball America. Scouts have praised Gordon’s speed, arm and glove as his best tools, noting that he’s a very good bet to remain at shortstop in pro ball. That doesn’t mean that he’s an all-glove prospect, however, as his bat has drawn high praise as well. Law noted that Gordon has “surprising power given his small frame; largely thanks to very strong wrists and above-average bat speed.” Mayo and Callis touched on Gordon’s ability to use the entire field at the plate, while BA called him an above-average hitter with doubles power that many scouts feel will grow into average home run power as he learns to pull the ball. MLBTR’s Zach Links spoke with Gordon prior to the draft as part of MLBTR’s Draft Prospect Q&A series. Gordon was committed to Florida State, though the expectation was that he would sign out of the draft. He is the third consecutive Top 5 pick that the struggling Twins have had; Minnesota selected No. 1 overall prospect Byron Buxton with the second pick in the 2012 draft and picked right-hander Kohl Stewart with the No. 4 overall selection in last year’s draft. Gordon is represented by the Beverly Hills Sports Council. MLBTR is re-launching its Draft Prospect Q&A series this season in order to give our readers a look at some of the top names on the board in this year’s draft. MLBTR will be chatting with some of the draft’s most well-regarded prospects over the next couple of weeks as they prepare for the 2014 draft on June 5-7. Florida’s Nick Gordon is universally regarded as the best shortstop in the 2014 draft and, according to some, is the best position player prospect in the draft. With a pedigree like his, it’s no surprise. Gordon is the son of three-time All-Star right-hander Tom “Flash” Gordon and the younger brother of Dodgers second baseman Dee Gordon. While his father made his mark in the game and Dee continues to see his star rise, all signs point to Nick making a terrific legacy of his own in the years to come. At 6’2″, 170, Gordon exhibits tremendous speed both on defense and around the base paths. Of course, he also boasts a terrific arm for the shortstop position and, in fact, many believe that he could pursue pitching if he wanted to. At the plate, the Olympia High School star projects to be an above-average hitter, but his intangibles and makeup have scouts drooling just as much as his physical tools. In 27 games last season, Gordon, reportedly being advised by Beverly Hills Sports Council, which also represented father Tom “Flash” Gordon and represents brother Dee, posted an absurd slash line of .494/.576/.843 in 99 plate appearances and stole 13 bases. The youngster has had the attention of college scouts and pro scouts alike for years, but his senior season helped to boost his stock even further. Zach Links: What advice has your dad given you about the draft process? Nick Gordon: He gives me very good advice. He just tells me to sit back and take it one day at a time, don’t stress out about these things. You can’t control what happens. I did my best and left it all on the field and after that it’s in God’s hands. ZL: What did you take away from your brother’s draft experience? NG: I just remember the great feeling we had afterwards. Just knowing the hard work he put in high school and to know that it was starting to mean something. He was ready for his moment and he earned it. ZL: Do you feel like your transition to major league life will be smoother than others thanks to your family’s experience and guidance? NG: I think I have a little bit of an edge because of my brother and dad. With everything I’m about to go through they can help me along the way and give me information that maybe some other kid might not get because of the relationships I have with my dad and my brother. ZL: Scouts look at you as a phenomenal shortstop prospect but there’s also talk that you could be a strong pitcher as well. Is that something that interests you? NG: I’ll do whatever my team needs from me. I love playing shortstop, it’s my Plan A and I don’t really have a Plan B. I think I can be a great one. But, if my team needs me to pitch, I’ll do whatever my team needs from me. ZL: Before you chose Florida State, what other schools were you giving serious consideration to? NG: Florida, North Carolina, Clemson, LSU, and a couple of other big schools. I even liked UCF a lot. ZL: Why did you ultimately choose FSU? NG: I went down and I loved it. Every bit of it. The coaching staff they have, the players, and just a great environment to be around. It’s like a home away from home for me and knowing the coaches there, it’s phenomenal. Being there I feel like I learned more about my game and myself. It also helped that I knew a couple of other players that have been there as well and they told me it’s awesome. ZL: Is there a certain range that you have in mind that would make you forgo college? Certain contract terms? Certain clubs? NG: I could see myself playing in every single uniform so every club interests me. I wouldn’t mind playing for every single club. I just want to play the game. My lifelong dream has been to play professional baseball and I want to fulfill my dream. Whichever organization I end up with, I know that God has a plan for me. ZL: If you had to call it now, what are the odds that you go to Florida State? NG: When that day comes for me to decide, I’ll talk it over with my family and I’ll do whatever is best for me, my mom, and my dad. I couldn’t really put odds or a number on it. ZL: I’ve read that you’re working to add muscle to your frame. What’s your weight right now and what’s your goal weight? NG: My goal weight is about 185, 190 pounds. When I get older, probably 24 or 25, then I’d like to be 195 or 200. Right now I’m at 177-180 pounds. ZL: Do you have any concern that more muscle will hinder your speed and agility? NG: Not at all. In fact I think it can make it just that much better. ZL: What’s the top thing you want to improve on as you go forward? NG: My strength and staying healthy and getting stronger. ZL: At what age did you realize that you had a good chance of becoming a major league baseball player? NG: I always believed that, ever since I was a kid I said I’d be a Major League baseball player. And when my teachers said, “You need a backup plan,” I said, “No ma’am, I’m going to be a baseball player.” All my life I’ve all I’ve known is baseball and I’ve always been striving to be a baseball player and an athlete. I was never okay with anyone telling me that I wouldn’t make it as a player. ZL: Did you play other sports growing up? Was there ever a point in your life where you thought your future might be in a different sport? NG: I played football and basketball. I played both up until 9th grade. I was playing football and I broke my ankle in 6th grade and then rolled it playing ball..or at least I thought I rolled it. My dad just told me that I bruised it. Whatever it was, I think it just told my brain [to stop playing] basketball and football. ZL: What positions did you play in each sport? NG: I played running back and slot back and safety in football and in basketball I played shooting guard and small forward. ZL: There was a report recently that the Astros are considering you at No. 1 overall. I’m sure you don’t want to address any team or outcome specifically, but what would it mean to you to be the very first player off the board? NG: It would mean the world to me. I know how much talent there is in this draft. You can’t really predict it and there are so many guys that could go No. 1, so it would be a blessing. If the day comes and I’m the No. 1 pick, that’d be great, but I’m taking it one day at a time. There’s so much great talent here and you can’t predict who will be No. 1. NG: I’d welcome a change because I know I can play in a warm or cold climate. I know that some guys have a hard time playing in cold weather and I know if I go out there in the cold weather, I’ll be fine. I want that change and that experience as well because just playing in the hot sun all the time can wear on you too. When I do get the chance to go elsewhere, I mean, it can get cold, but if I’ve got to play in the cold or the sun, I’m going to play the same way no matter what. There’s no difference in my mind. ZL: You’ve spoken quite a bit about your relationship with God. How has that shaped you as a baseball player and as a person? NG: I thank God every moment, for everything I get, everything I do. My faith is a very big part of my life experience and my success in baseball. I thank God for everything and the position he’s put me in and even when he allows for me to learn from my mistakes. ZL: Recently it was announced that you’ll be one of just seven prospects in attendance on draft night. Who will be with you? NG: My mom, my father, my little sister, my little brother, and my coach and his wife. ZL: Will you be nervous on draft night? NG: I think I’ll be a little bit nervous, but I think I’ll be relieved when I hear that today is the day I’m welcomed into professional baseball. ZL: Did you ever find it challenging to keep yourself focused on your high school team’s goals as you prepared to take the next step in your career? NG: Not at all. It’s actually pretty fun for me to sit there and play with my teammates. I enjoyed it as much as I could and I rarely thought about things concerning the draft. A lot of times my coach would come to me and say, “Wow, it looks like you’re not really thinking about the draft too much,” and I just said that I’m enjoying my teammates…I’m appreciative of every moment I had with them. I loved playing with those guys. ZL: We all know that you’re not going to last until the Dodgers’ pick at No. 22, but how cool would it be to play alongside your brother on the other side of second base? NG: It’d be pretty cool but it’d be competition every single day even though we don’t play the same position anymore [laughs]. We’d give each other a handful but it’s brotherly love. I mean, that’d be great. It’d be a blessing to play next to my brother and my family would love that as well. ZL: Who wins in a footrace, you or your brother? NG: I don’t know…well…he’d get me. There’s not too many people in this world that can run as fast as him. He wouldn’t beat me by much, but he’d get me. ZL: How about basketball in the driveway, 1-on-1? NG: I’d dunk on him. ZL: As someone whose lifelong dream has been to dunk a basketball, I’m jealous. At what age could you dunk? Brady Aiken and Carlos Rodon have been mentioned the most frequently as potential options for the No. 1 overall pick in this year’s draft, but CBS Sports’ Jon Heyman expands on a rumor that has been picking up steam that could have the Astros cutting a deal with high school shortstop Nick Gordon (brother of Dee Gordon and son of Tom Gordon) in order to spend more heavily elsewhere. Heyman notes that it could very well be just a rumor, but it’s “stirring intrigue in baseball circles.” It wouldn’t be the first time that Houston cut a deal at 1-1, as just two years ago they elected to select Carlos Correa in order to later sign Lance McCullers Jr. and Rio Ruiz to over-slot deals. One agent tells Heyman that he thinks Houston will look to cut a deal, with a second agent telling him the Astros are “all about the deal” and rival executives expressing that they simply can’t even guess what the Astros and GM Jeff Luhnow will do. ESPN’s Keith Law tweets that he didn’t buy the Gordon/Astros rumor when he first heard it, and he’s still not a believer. Scout.com’s Kiley McDaniel tweets that the Gordon rumor is still alive and adds another to the mix, noting that the Blue Jays could reach and select Virginia righty Nick Howard as high as No. 11, while several other teams in the teens are kicking the tires on Howard. That would be quite the reach in comparison to the rankings of Howard by MLB.com (No. 75) and Law (No. 59). Baseball America is more bullish on Howard, ranking him 25th among draft prospects. Law appeared with ESPN’s Buster Olney on today’s Baseball Tonight Podcast to discuss a host of draft-related topics (Law appears from the 23:00 mark to the 45:00 mark). Law began by sharing a great deal from his experience with the Blue Jays’ front office, including the inner workings of a draft room, the unheralded successes of some area scouts and the change in decision-making processes as the draft progresses into the later rounds. Law feels that if Aiken, Rodon and Kolek are all off the board, the Cubs will cut a deal at No. 4 and turn around to “crush pitching” with their next several picks. He currently has them selecting Oregon State outfielder Michael Conforto, who brings an element of plate discipline that their current top prospects lack. He adds that he could also see them cutting a deal with Nola, though he sees Nola as more of a mid-rotation starter (that could be in the bigs in a year’s time) than an ace.